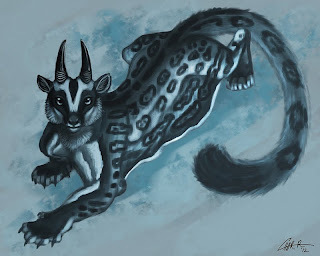 A medium sized creature, the Snow Glider Goat lives in the mountainous regions of Northern Asia. Primarily solitary animals, a male's territory overlaps several female's. Breeding takes place in Oct-Dec and kits are born in May. Females can have litters up to 5 babies, but more often have twins. An omnivorous diet allows this creature to survive in the cold temperatures, as plant matter and small animals are on it's diet. It has a low slinking walk that is mostly due to one of it's most fascinating features- the Glider Goat can jump and use it's stretchy flaps of skin to expertly glide from one side of a mountain cliff to another lower cliff. This allows the Goat to drop down on unsuspecting prey or a nice grassy patch that is just out of reach.